In 1988 in the area of these places, at the bottom of the Red sea, about 600 wheels from Ancient Egyptian carts were found. 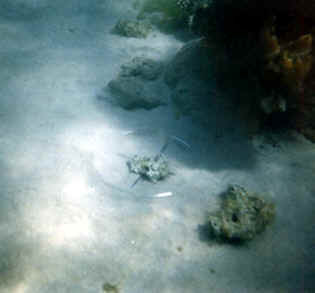 Whence is in the middle of the Red Sea such quantity of wheels? The Red Sea didn’t change its borders: the middle of the sea was and is in the same place. The answer can be found only in the Bible: these are wheels from the pharaoh’s carts, on which the Egyptian army, pursuing the Jews, reached the middle of the parted sea, and God closed the waters of the sea above their heads and all the army of the pharaoh sunk. The research of the wheels showed that they belong to time of 18th dynasty of the Egyptian kings, which absolutely coincides with the time specified in the Bible. 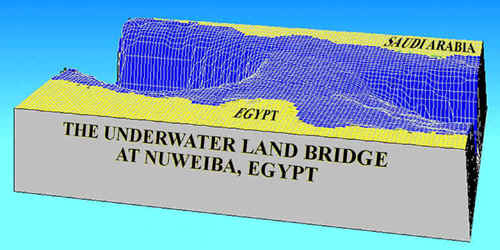 But the most surprising thing is the underwater ground bridge at the bottom of the Red Sea. Just in the place where, as it was supposed, Jews crossed the river. 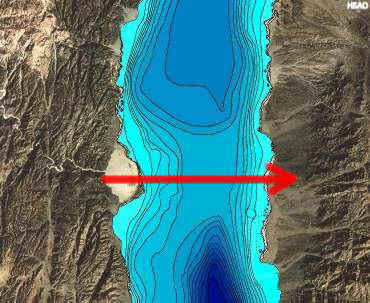 All along the Gulf of Aquaba the depth reaches 5000 ft on the average (or approximately 1500 meters). The steepness of the descent in water on the Egyptian coast makes 45 degrees. And only in one place, on the coast Nuweiba, the underwater bridge descends with gradual inclination in 6 degrees on depth only of 100 meters. The distance from Nuweiba to Saudi Arabia is about 13 kilometers. The width of the underwater bridge is about 900 meters. The Jews didn’t know it; even if they knew, it didn’t make any difference for them: they didn’t have ships, even boats. 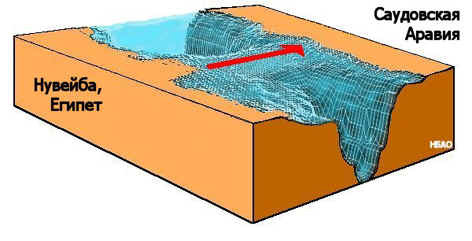 God created this isthmus for them to balance water walls of the parted sea. On the coast of the outcome Ron found a column lying nearby the water. On the opposite coast, in Saudi Arabia, he found another, precisely the same column with an inscription in Hebrew which says: “Mizraim (Egypt), Solomon, Edom, Death, Pharaoh, Moses, Yahveh”. 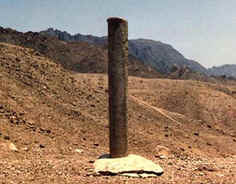 He assumed that these columns were erected by Solomon in memory of the crossing over Red Sea. The inscriptions on the column found on the Egyptian coast were destroyed by water. Subsequently the authorities established it on the concrete basis.